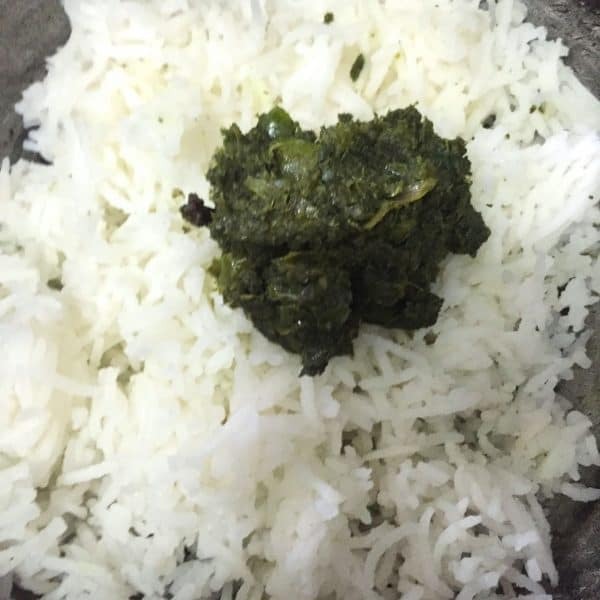 Pudina Rice or Mint Rice - A deliciously tasty rice, made by mixing cooked rice with a spiced mint sauce. 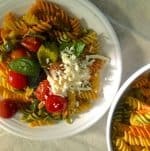 Nutritious and so easy to make! Cook the rice. If using Basmati rice, wash the rice well until the water is clear and the starch has washed away. 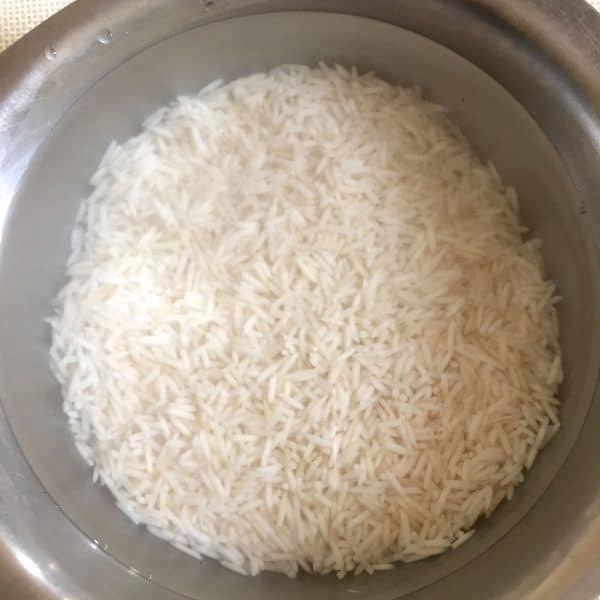 Soak the rice for 15 minutes . 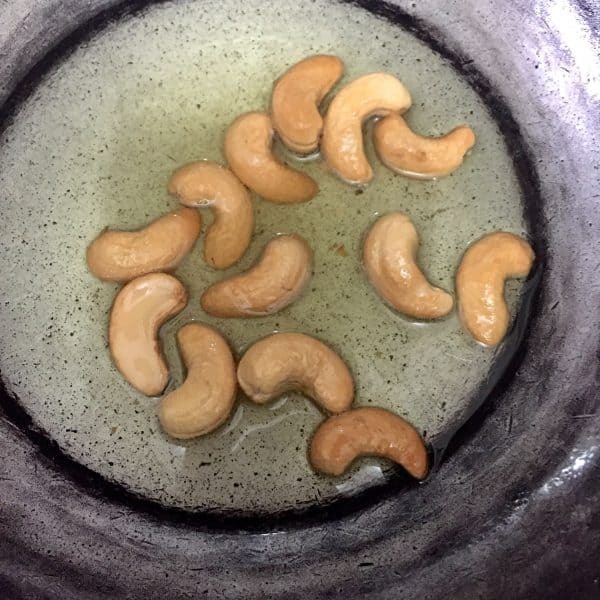 Transfer to a colander and set aside to drain for about 10 minutes. Place the rice in a pan on the stove, squeeze a little lemon juice. Add water - double the volume of the rice. Bring to a boil on a high flame, turn the stove to low flame and then cook covered for 10-15 minutes or till the rice is done and there is no water left in the pan. Watch the rice when it is cooking to ensure it does not burn once the water boils away. Cover and set aside the cooked rice for at least 10 minutes before use. Wash the rice well until the water is clear and the starch has washed away. 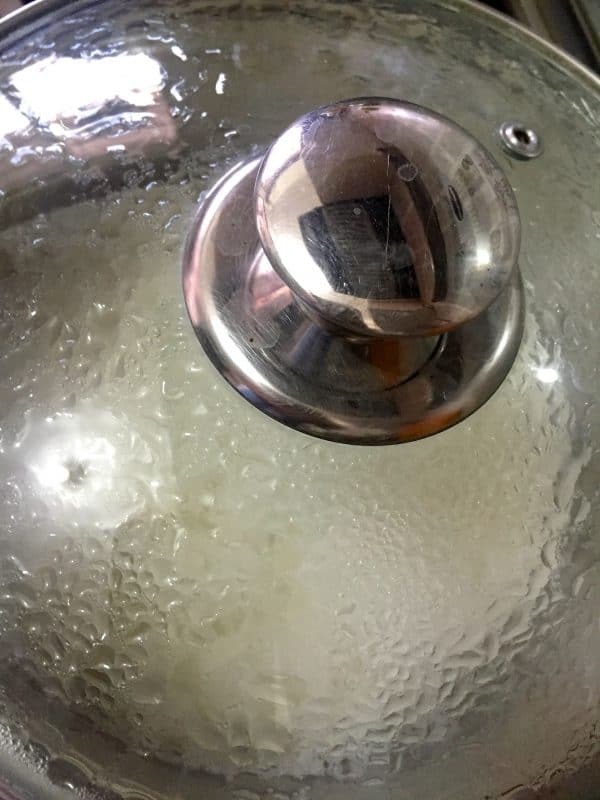 Soak the rice for 10 minutes, drain in a colander. Pressure cook for one whistle, reduce the flame to low, and cook for another 5 minutes. Switch off the stove. 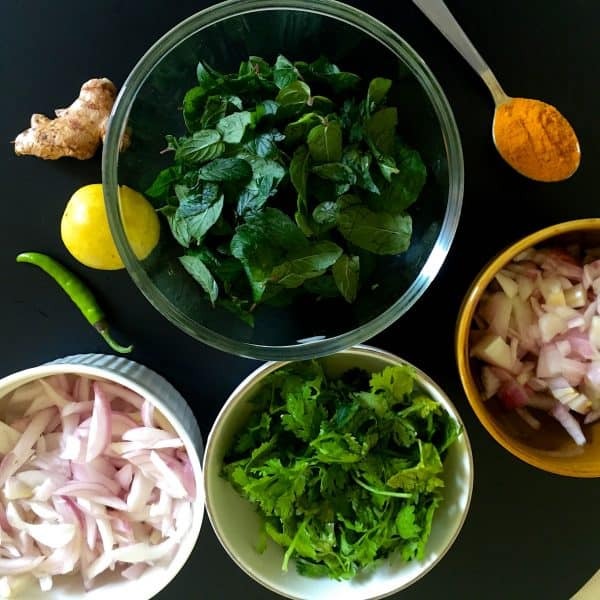 Wash the mint leaves and remove the stalks. 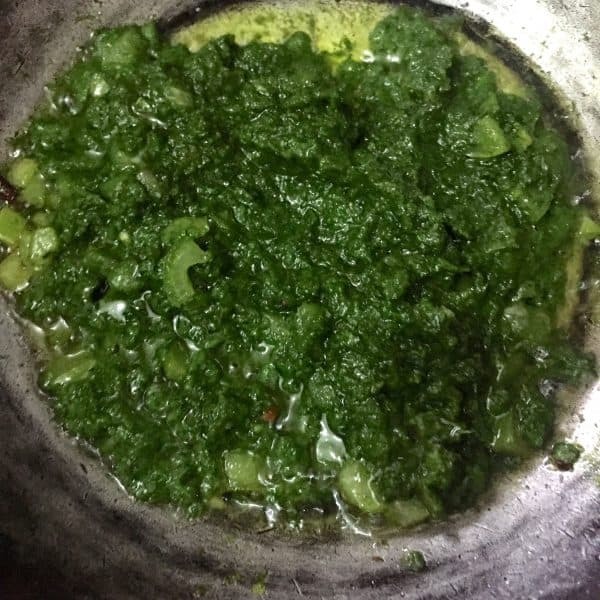 Grind the mint and coriander leaves, the onion, ginger and chilli and the lemon juice, into a smooth chutney (pesto like consistency) without adding water. The moisture clinging to the mint leaves after washing them should suffice, however if required, add a spoonful of water to help it along. 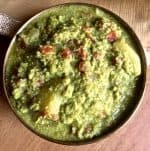 The turmeric in the image above is not to be used while grinding, but will be added during tempering, at the next stage. The larger bowl of onions is for the caramelisation. Heat a pan and add the oil. Use a sunflower oil, or any other vegetable oil which does not have a strong aroma and flavour. To the remaining oil, add the whole spices of your choice. I used cinnamon, clove, cardamom and star anise. 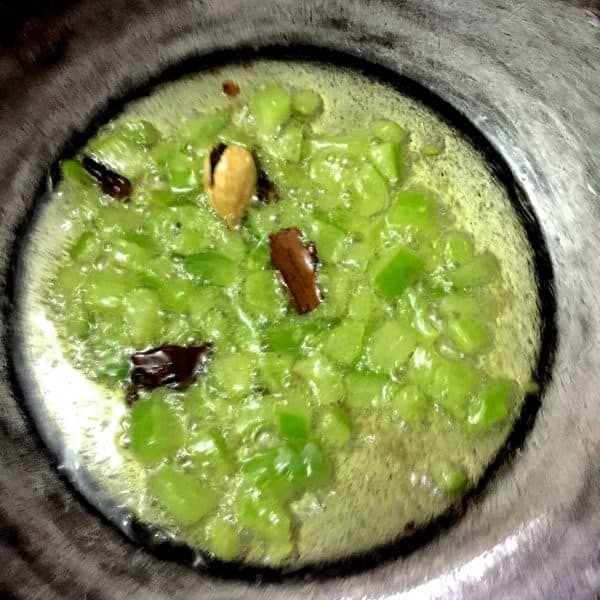 Bay leaf may also be added. 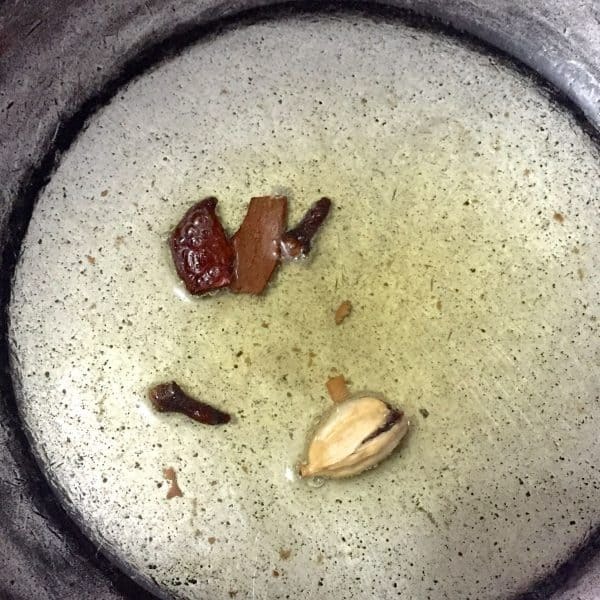 I crushed the cardamom while still in the pod, so that I could remove it before serving. Nobody really likes to bite into cardamom! Sauté on low flame for about 30 seconds. Add the capsicum, sauté for 1 minute. 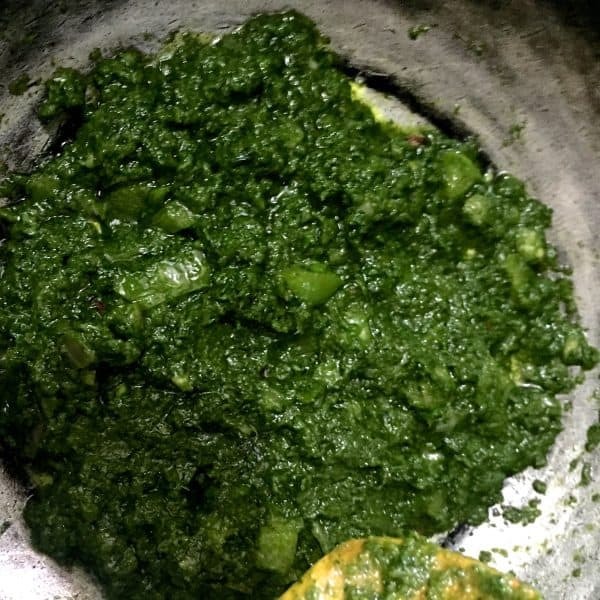 Add the pudina chutney (ground mint paste), sauté. Add turmeric, stir it in. Add salt, stir it in. 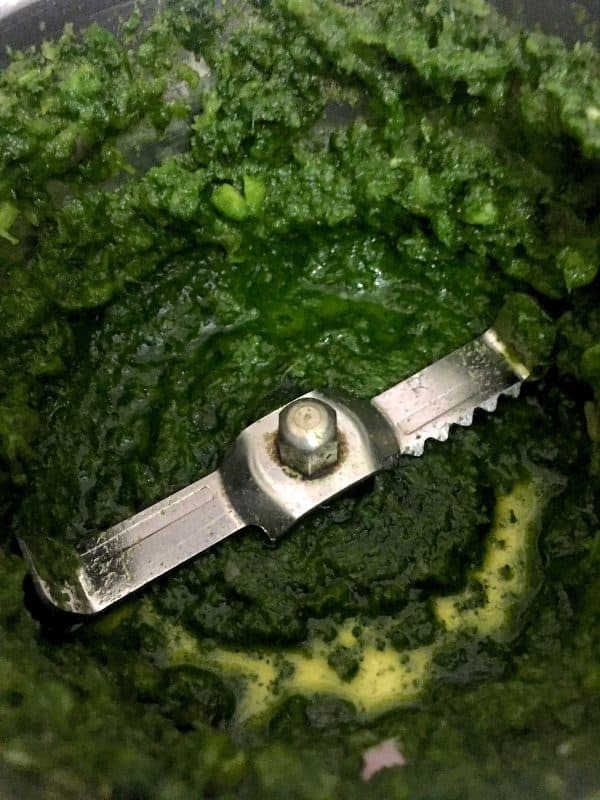 Turn off the stove and transfer the mint sauce to a dry container. Instead of mixing all the rice with all the sauce, do it in stages so that you mix only as much rice gives the best taste, rather than running out of sauce. Take half the cooked rice and transfer to a wide bowl. Add a little salt - upto about 1/2 a teaspoon, and taste it. 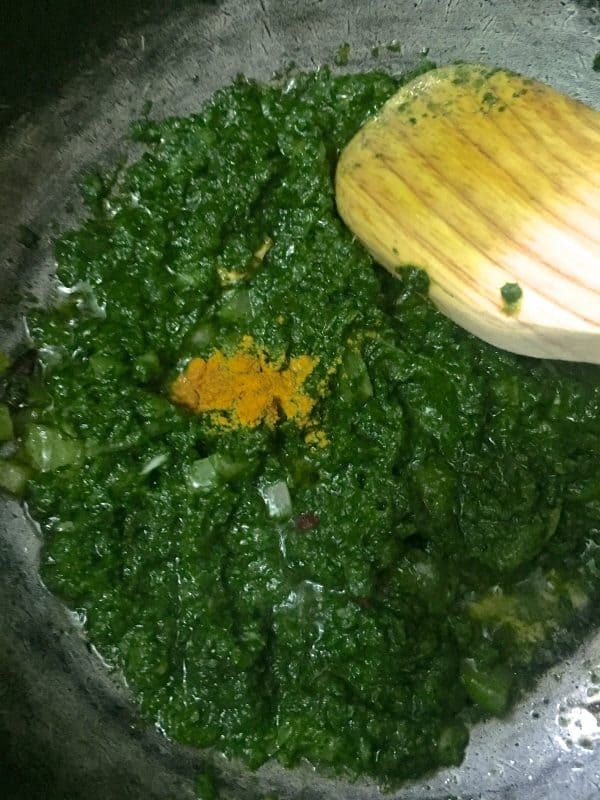 There is some salt in the pudina sauce, so be cautious in adding salt. Add half the pudina sauce, mix it gently into the rice without mashing or breaking the rice. 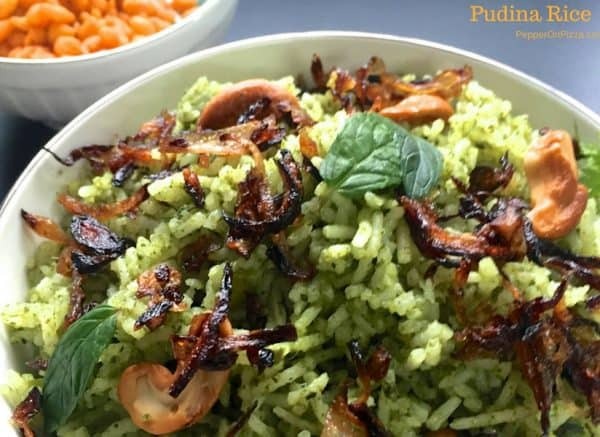 Add more rice, then more pudina sauce, until all the pudina is used up. 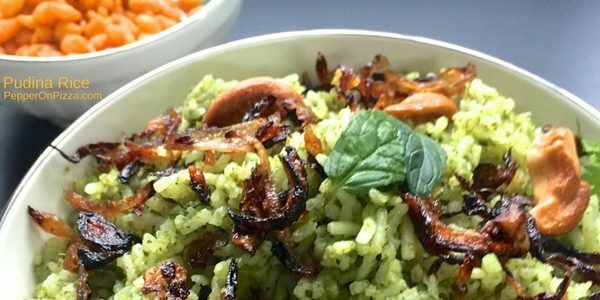 You should get a pale green coloured rice, with the distinct flavour of mint, without being overpowering. 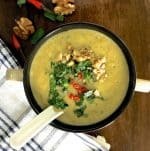 Transfer to a serving bowl, garnish with the fried nuts, browned onions, if using, and a few coriander and mint leaves. 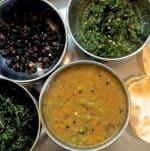 Serve with a raita (spiced yogurt dip). 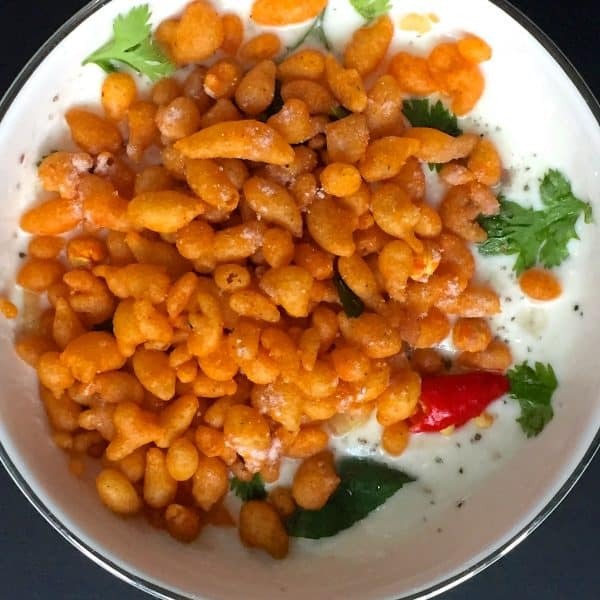 A boondi raita or a plain onion raita or a tomato raita, would go well with this dish. 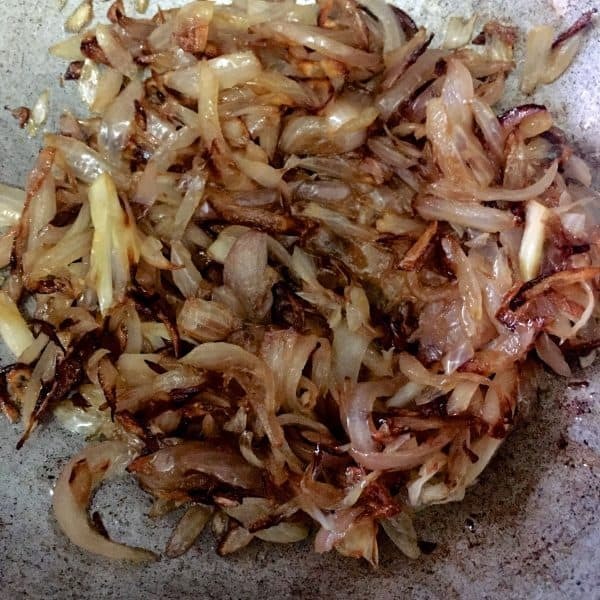 To Brown the Onions for Garnish: time: 30 minutes. Slice the onions into thin long strips. Heat a wide pan and add oil. About 1 tablespoon of oil for 1/2 cup of onions. Sauté on medium to high flame for 2-3 minutes, stirring frequently. Lower the flame, and saute for about 20 minutes, stirring frequently, till the onions are browned. 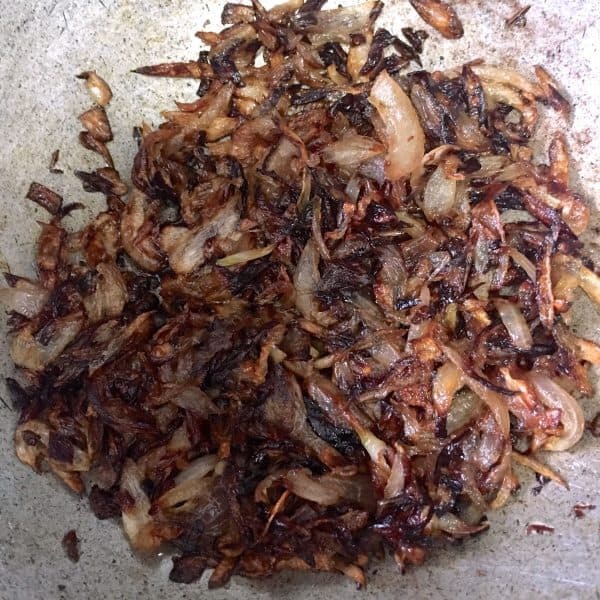 I have only browned the onions, and not caramelised them here, so 15-20 minutes should suffice. 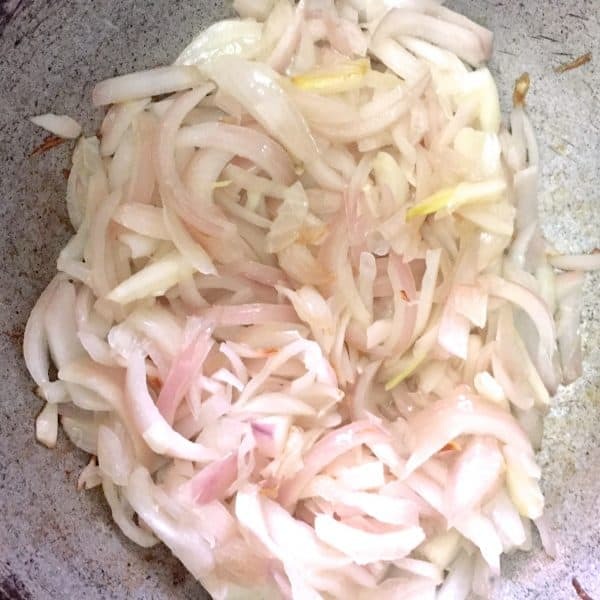 In the image below, I was multi tasking and some of the onion had begun to blacken, so you need to watch the onions and stir so they do not char. Remove from the pan and allow to cool. 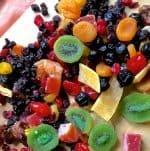 Transfer to a dry container and store in the fridge for upto a week, using as required.